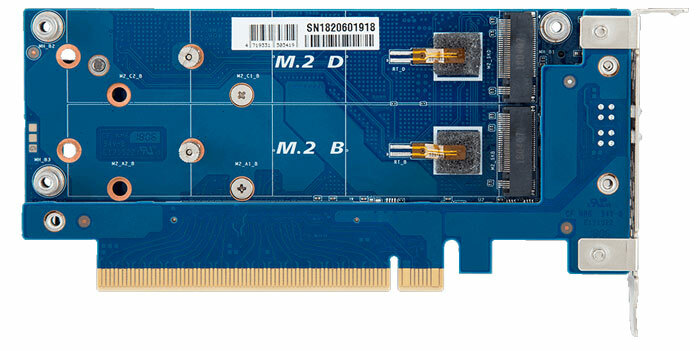 Gigabyte has quietly introduced a brace of new PCIe add-in cards that facilitate the addition of multiple M.2 storage devices to PCs and servers. As spotted by Guru3D, the two expansion cards are dubbed the Gigabyte CMT 4032 and CMT 4034. These devices support two or four PCIe Gen3 x4 M.2 SSD drives respectively. The Gigabyte CMT 4032 and CMT 4034, due to the number of drives they can support, have different minimum PCIe slot requirements. The CMT 4032 with its capability to add two PCIe Gen3 x4 M.2 SSD drives requires a PCIe x8 (Gen3 x8 bus) connector slot, meanwhile the CMT 4034 needs to be fitted into a PCIe x16 (Gen3 x16 bus). The devices are both low profile form factor PCIe cards and measure 150 x 68.9 mm, but if you look closely at the CMT 4034 (main pic, and comparison left above) you will see it features two PCBs, sandwiched together, and this card features two M.2 slots on either side, slots A to D. If you are interested in the CMT 4034 to perhaps expand your PC, Gigabyte warns that this SKU is "for Gigabyte Purley generation server system use only". There is no such warning within the CMT 4032 specs. Whichever of the above you might purchase, the slots are compatible with M.2 Type 2280/22110 cards, i.e. those that measure 22mm x 80mm, or 22mm x 110mm. You can only use PCIe SSDs, not the M.2 SATA type cards. Both the CMT 4032 and CMT 4034 provide metal heatspreaders for the installed drives and thermal sensors and link/activity LEDs for each individual M.2 slot. At the time of writing there is no info about pricing and availability. 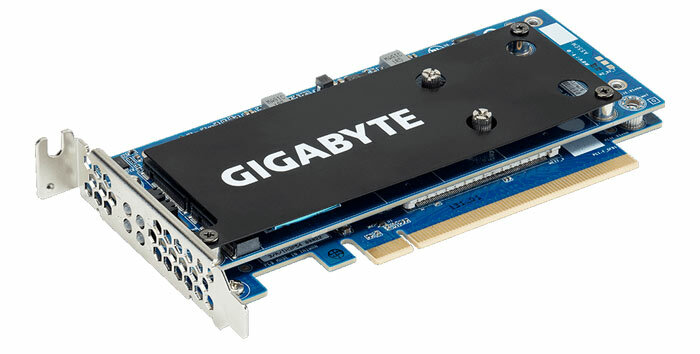 Gigabyte asks its business customers to order a minimum of 12 of either SKU. famous place, know what i mean? nudge nudge, wink wink.